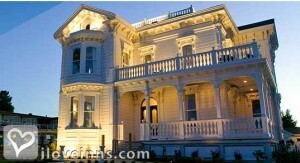 Santa Cruz bed and breakfast travel guide for romantic, historic and adventure b&b's. Browse through the iLoveInns.com database of Santa Cruz, California bed and breakfasts and country inns to find detailed listings that include room rates, special deals and area activities. You can click on the 'check rates and availability' button to contact the innkeeper. When Californians entertain the idea of going out to ride the waves, many want to go go to Santa Cruz. This is expected as Santa Cruz is aptly called Surf City USA. In fact, innkeepers at Santa Cruz bed and breakfast inns say that most of their guests actually visit the place to surf. The good thing about it is that most of these Santa Cruz bed and breakfast inns are conveniently located near the beaches. Aside from surfing, tourists coming to Santa Cruz can have fun while having trips to the Wilder Ranch State Park, the Natural Bridges State Park, and the Seymour Marine Discovery Center. While in the city, a couple of the first places that they should visit to mingle with the locals and fellow tourists are the Santa Cruz Beach Boardwalk, its wharf, and the main beach.